Brigadier General C. Claude Teagarden, 65, of Jackson County's Pine Creek community and Palm Coast, Florida, died Friday, June 30, 2000, at Mayo St. Luke's Hospital in Jacksonville, Florida. Burial will be in Arlington National Cemetery, Washington, D.C.
Born in Galesburg, Illinois, he was an Eagle Scout and graduate of Galesburg High School. He received a bachelor of science degree in agricultural economics, a juris doctor degree from the University of Illinois and an MBA from Rollins College in Winter Park, Florida. While a student at the University of Illinois, he served as president of the Interfraternity Council, president of the Student Bar Association and assistant dean of men. Having received a commission in the U.S. Air Force, he served as a judge advocate from 1958-1982, achieving the rank of Brigadier General. He was a distinguished graduate of the Air Command and Staff college and the first Air Force judge advocate to attend the National War College. He served as judge advocate at Sidi Silimane Air Force Base, Morocco; McCoy AFB, Florida; and Albrook AFB, Panama, where he was director of civil and international law, USAF Southern Command. While assigned to the Office of the Judge Advocate General in Washington, D.C., he defended civil law suits brought against the Air Force and its officials in federal courts throughout the United States. He was selected to be the executive to the Judge Advocate General of the Air Force. Later, he was assigned to be staff judge advocate at Headquarters USAF, Europe, and the Strategic Air Command, Omaha, Nebraska. Claims, the U.S. Court of Military Appeals and the Supreme Court of Illinois. His military decorations and awards included the Distinguished Service Medal, Legion of Merit with oak leaf cluster, Meritorious Service Medal, Air Force Commendation Medal and the Albert Kuhfeld Award for 1967. After retiring from the Air Force, he returned to Jackson County. He was professor of business law at Western Carolina University from 1982-1996 where he served as head of the department of accounting, computer information systems and management and a member of the Faculty Senate. He was a past president of the Southeastern Academy of Legal Studies in Business and was a member of the House of Delegates, National Academy of Legal Studies. He served as the WCU faculty representative to the NCAA and the Southern Conference executive committee for seven years. For two terms, he was chairman of the Jackson County Board of Elections. Surviving are his wife, Jeanne B. Teagarden; one daughter, Kristen T. Batlle of Jupiter, Florida; one son, Jeffrey C. Teagarden of Temple Terrace, Florida; and four grandchildren. A memorial scholarship will be established at Western Carolina University through the WCU Development Foundation - C. Claude Teagarden Scholarship Fund. The General was laid to rest in Section 30 of Arlington National Cemetery. Brigadier General C. Claude Teagarden was the staff judge advocate, Strategic Air Command, with headquarters at Offutt Air Force Base, Nebraska. 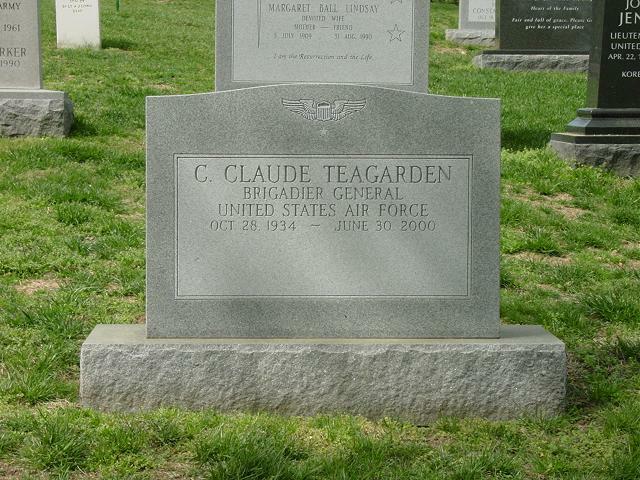 General Teagarden was born in 1934, in Galesburg, Illinois. After graduating from Galesburg Senior High School in 1952, he attended the University of Illinois where he graduated in 1956 with a bachelor of science degree in agricultural economics and commissioned a second lieutenant through the Air Force Reserve Officers' Training Corps program. He was awarded a juris doctor degree in 1958 from the University of Illinois and a master of business administration degree in 1963 from Rollins College, Winter Park, Fla. He was a distinguished graduate of the Air Command and Staff College, Maxwell Air Force Base, Ala., in 1966 and the National War College, Fort Lesley J. McNair, Washington D.C., in 1973 as the first Air Force judge advocate graduate. His first assignment was to Sidi Slimane Air Base, Morocco, in January 1959 as assistant staff judge advocate, 3906th Combat Support Group. In February 1961 he was assigned to McCoy Air Force Base, Fla., where he served as assistant and then staff judge advocate, 321st Combat Support Group (redesignated the 4047th Combat Support Group and later the 306th Combat Support Group) until August 1965. He then attended Air Command and Staff College. suits brought against the Air Force and its officials in federal courts throughout the United States. 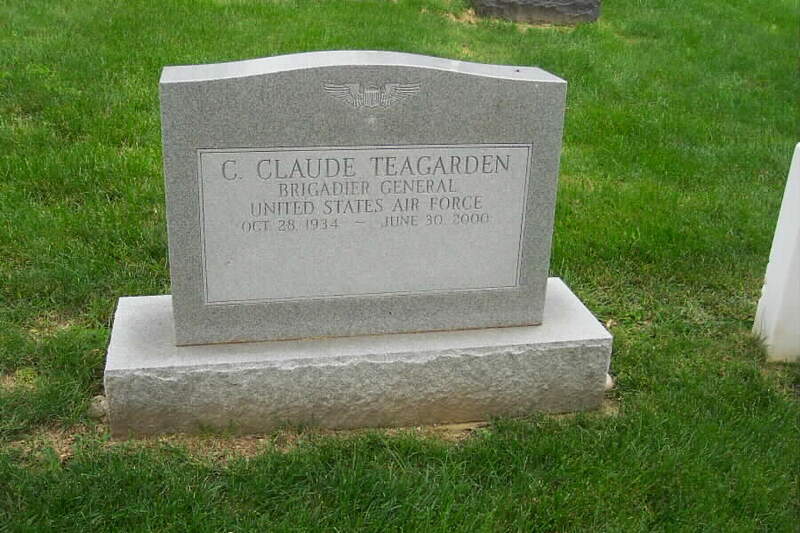 He entered the National War College in August 1972 and in June 1973 General Teagarden was selected to be the executive to the judge advocate general of the Air Force. In June 1977 he became staff judge advocate at Headquarters U.S. Air Forces in Europe, Ramstein Air Base, Germany. He assumed his present duties in August 1980. His military decorations and awards include the Distinguished Service Medal, Legion of Merit with oak leaf cluster, Meritorious Service Medal, Air Force Commendation Medal and Albert M. Kuhfeld Award for 1967. He is admitted to practice law before the Supreme Court of the United States, U.S. Court of Claims, U.S. Court of Military Appeals and State of Illinois Supreme Court. He was promoted to brigadier general July 1, 1980, with date of rank June 22, 1980. General Teagarden is a resident of Port Charlotte, Fla.